Between Friends: When Zephir and Celeste have an accident they soon find themselves battling out their trial in court. Babar is caught in the middle, forced to be the Judge of who is guilty of causing the mishap. King Tittle's Vote: Rataxes 'king-naps' King Tuttle, the Tortoise King, so he cannot sign Babar's treaty that would force Rataxes to stop dumping garbage into the river. The Elephant Express: When Rataxes refuses to let Babar b.. The Show Must Go On: When Babar organises a world class ballet to be performed in Celesteville, the star of the show, makes problems for his friends in the cast and crew and turns Babar's production into a disaster. 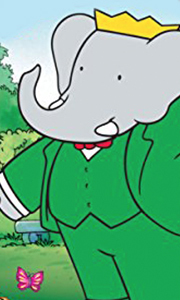 To Duet Or Not To Duet: Babar is scheduled to perform a duet with a great pianist at a concert. However, he refuses to admit that the piece of music is too hard for him, so he practises and practices until he feels so guilty..